Elektrotermia is a reputable Cracow-based company with more than 50 years of tradition in the production of heating elements. Moreover, we are the official distributor of Kanthal brand heating systems and resistance materials. We specialize in the production of heating elements tailored to the individual needs of our customers. We approach each project individually, customizing products to best fit our client's requirements. Furthermore, our experienced design engineers and process engineers are able to prepare an optimum individual design or perform the order according to the specification. We own the entire production chain which enables us to offer competitive prices even for individual or small batch production. The production plant includes complete metalworking and powder coating lines and a full range of modern equipment, such as laser cutting machines, folding presses, welders, etc. Since 1949, FRITZ HANSBERG S.p.A. designs and manufactures, a complete range of Core shooters for the cold-box and hot-box processes. These high-performance, world-class machines are truly built for the foundry, designed and manufactured to be employed on a continuous basis for 6 days/week, 24 h/day. All machine versions can be adapted to the required tooling dimensions, or to allow for the use of existing tooling with minor modifications. Tasks such as core pick-off, defining, assembly, coating, transfer, setting, etc. are more and more often performed automatically with the aid of gantry manipulators and industrial robots. Core handling equipment design involves thorough co-engineering with the Customer, and is the results of in-depth technical exchange between the supplier and the Foundry’s tooling, process and methods engineers. Automatic core setting reduces mold and casting scrap caused by operator’s loss of concentration and fatigue. High-capacity, low prevalence suction devices are often used for core pick-off instead of mechanical grippers on account of the associated simpler and inexpensive tooling construction. The HLM Series offers smoother, quieter, more energy-efficient operation and lower maintenance requirements, to increase mold quality, productivity and profitability. Hunter Foundry Machinery Corporation introduced its most highly advanced matchplate molding machines, the HLM Series, to the world foundry market at GIFA 2015 (the industry’s largest trade conference). According to company President and CEO Bill Hunter, who invented the HLM Series, the product line integrates the industry’s latest matchplate molding innovations and advancements, to help foundries produce higher quality, near net-shape castings more profitably than ever before. “The HLM Series’ low-maintenance features and functions maximize performance and minimize downtime, which add up to greater efficiency of operation,” he stated, adding that the HLM’s successes at customer sites throughout North America prove its readiness for the world foundry market. “The HLM Series integrates patented, proprietary technologies with customer-demanded, proven features and functions to create our most advanced matchplate molding machine,” Hunter stated. To date, 13 HLMs have been ordered and seven are in operation. Additionally, six of the 13 are repeat orders, according to Mr. Hunter. HIGHLIGHT FEATURES & TECHNICAL ADVANCES Hunter’s HLM is a proprietary concept in automated matchplate molding technology that combines and integrates magnetically coupled rodless cylinders and linear bearings for improved movement of multiple components. Here are the primary features and benefits of the HLM Series: • Sealed linear bearings and magnetic rodless cylinders replace cam followers, wheels, slippers and rails, to provide smoother, quieter, more energy-efficient operation and greater machine stability, with less maintenance required. • The HLM’s board feeder incorporates magnetically coupled rodless cylinders. • Linear bearings guide the hopper car to reduce maintenance needs and costs. The HLM Series also includes two standard options: 1. Separation of the hydraulic power system (for cleaner, easier maintenance) and 2. Linear motion-operated, programmable access doors (for maximum operator protection). Features standard to Hunter molding machines found in the HLM Series include the Human Machine Interface (HMI) system, which digitally controls compaction speed while monitoring resistance, producing a uniformly hard and superior-quality mold, and an auto-lock hydraulic pattern clamping system that eliminates the need for pattern bolt-down and provides true drop-in pattern changing capabilities. Iskra ZMiLS is the producer of machines and special purpose devices for the automotive, bearings and tire industry. Our machine park allows us to produce a wide range of machine parts not only for our own projects, but also for external distribution. We execute projects through all its stages, starting from the concept, through to preparation of documentation, machining parts, electrical and mechanical assembly, programming, installation, start-up and final inspection and testing. Iskra ZMiLS is the official representative of R+K. JSC "Minsk Heating Equipment Works" is one of the leading manufacturers of heating equipment in the CIS, a highly mechanized enterprise with mass production, developed iron and assembly. Production capacity of the enterprise, the high level of technology and the availability of highly qualified engineers and skilled workers can produce a wide range of products, high quality and competitiveness. We produce cast iron sectional heating radiators, fittings, art casting and others. We are always open for a comprehensive and mutually beneficial partnership, lasting and long-term cooperation. Linn High Therm with over 100 employees is based In Eschenfelden, Bawaria. It specializes in production of industrial and laboratory furnaces/kilns, microwave furnaces, sample preparation units for spectroscopy, induction heating systems, precision fine casting systems and custom built units. BLASTMAN ROBOTICS LTD., OULU, FINLANDIA; industry blast robots for the cleaning of the oversize castings. RUMP STRAHLANLAGEN GMBH & CO. KG, SALZKOTTEN, NIEMCY; wheel blasting devices, blast rooms. MHG STRAHLANLAGEN GMBH, DÜSSELDORF, NIEMCY; pneumatic blast cabinets. WALTHER TROWAL GMBH & CO. KG HAAN, NIEMCY; vibratory and disc centrifugal finishing devices for deburring, grinding and polishing, consumables. METEF - Expo of Customized Technology for the Aluminium, Foundry Castings & Innovative Metals Industry. The next edition of METEF will be held in Verona (Italy) from 21st to 24th June 2017 and it will dedicate special attention to the AUTOMOTIVE and metals RECYCLING sector by staging top-level initiatives and technical conferences where excellent companies will present their contribution in terms of innovation and competitiveness. PROMET FOUNDRY s.r.o. was established in 1994 and became part of the PROMET GROUP. Foundry focuses on the production of grey and nodular cast iron. Production capacity of about 8,000 tons per year is fully utilized by three lines, one automatic moulding line for castings from 1 kg up to 70 kg and two hand moulding lines for castings from 50 kg up to 1600 kg, in maximal frame dimension 700 x 700 x 250/250 mm. Long-term as well as new partners are provided with the complete solutions from the choice of most suitable technology to the final product delivery. Besides domestic market the foundry products are supplied all over the Europe, especially to Germany, Sweden and France. The State Enterprise "Malyshev Plant" is a diversified enterprise to manufacture civil and defense products which includes the own ferrous and non-ferrous foundry. The matter to visit the exhibition is a familiarizing with the presented foundry techniques, control and equipment and to consider the ability of its implement in our business. The Association, founded in 1936 is a voluntary, non-governmental organisation associating engineers and technicians working in the to foundry industry and foundry institutions. It operates at the territory of Poland. The Association is a member of the World Foundrymen Organisation (WFO). As a member of this Organisation it is active in the international foundry field. The Polish Foundrymen's Association is engaged in the organisation of workshops, conferences, symposia, competitions, technical trips etc. The Association has its own oficial journal under the title PRZEGLĄD ODLEWNICTWA (Foundry Review). Foundry Review, monthly journal is the oldest scientific-technical journal in Poland concerning foundry practice. It is distributed among Polish foundries and companies using castings in their production, as well as among the majority of engineers and technicians working in foundries. It is also sent abroad. 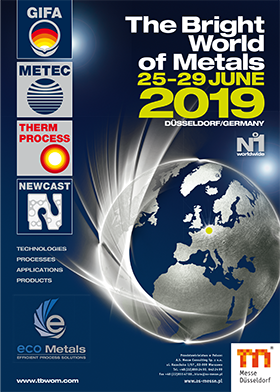 Alongside the information about technical news, organisation quality, environmental protection, history of foundry practice, the journal inserts the advertisements of domestic and foreign companies producing maschines, equipment materials and castings. Journal presents titles of articles from foreign journals as well as original works of foreign authors. TATRA Metalurgie s.r.o. is the leading Czech manufacturer of castings and forgings distributed in many European countries. Today´s activity follows the traditional long-term production and business of the foundry Tafonco and the forge shop Taforge. Wide range of castings and forgings is created for the automotive industry, rail industry, agricultural machines, construction machinery and lifting equipment markets. Foundry production is focused on iron, steel and aluminum alloys castings. Cast iron and steel castings in weight from 5 up to 400 kg per piece are processed on the automatic moulding lines. Mould aluminum castings in weight from 0.1 kg up to 100 kg are manufactured by hand and by machine. Total production capacity of the foundry is about 30,000 t per year. Stainless and carbon steels forgings in weight from 0.5 kg up to 60 kg are manufactured in forge shop with the production capacity of about 15,000 t per year. Long-term as well as new partners are provided with the complete solutions from the choice of the most suitable technology to the final product delivery. products. He company is also representative of Datapaq and FLUKE Calibration. The Unitary Enterprise «Industrial Ecological Systems» offers the gas cleaning systems on the «turn-key» basis directly from the manufacturer for the processes with the emissions of organic contaminants and associated suspended solids and tarry matter.